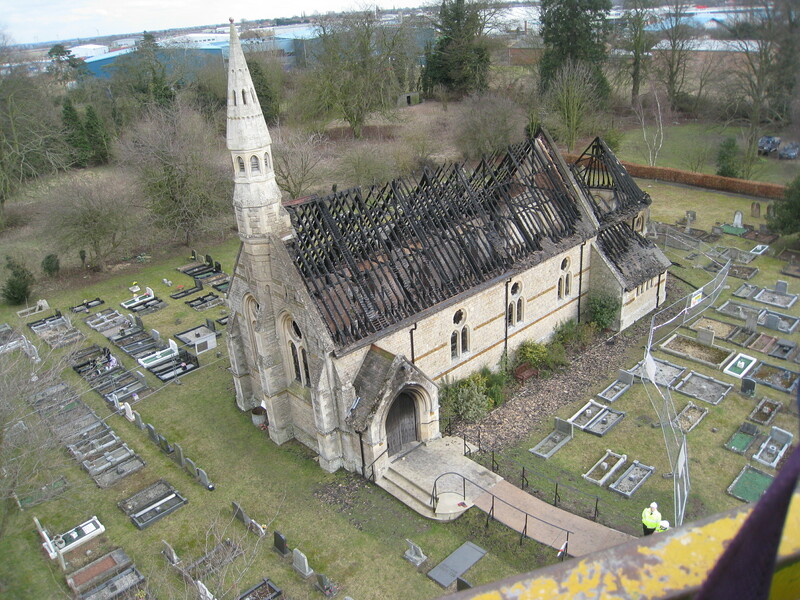 St. Mary's Church was set ablaze. Architect Shona Mc Kay assessed the damage and sought permission for the first stage of the work. The contract to restore the roof, windows and stonework awarded to Bowman and Sons of Stamford, Lincs. Work to repair the damaged stonework and replace the roof continued behind the protection of scaffolding and plastic sheeting. The King post trusses for the roof were erected and the new chancel arch and restored stonework became clearly visible. 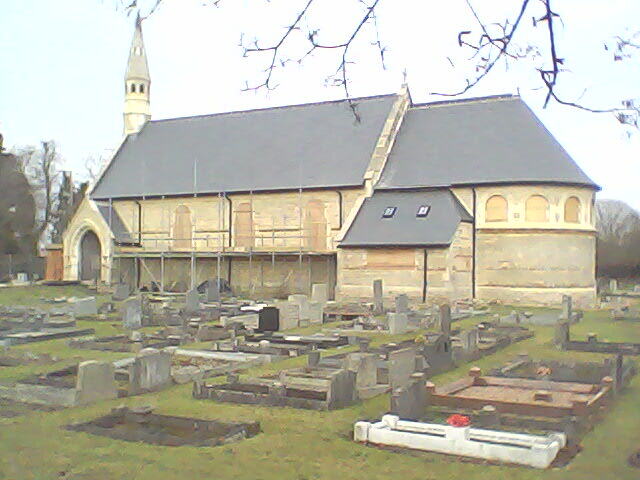 2 years after the fire and St Mary's church has emerged from behind the scaffolding and the protective sheeting. The beautifully restored stonework and a fresh new roof can now be seen. The glass in the windows has been replaced but is still protected with boarding until the work inside the building is complete. An amazing amount of dedicated work has gone on in these two years and it is a pleasure to see that such skilful craftsmanship is still being practised. Our thanks are due to Bowman and Sons for the completion of this phase. Following approval of the Faculty for the next phase of the work, the contract has been awarded to the Coulson Building Group ofCambridge . Work has commenced on the restoration of the interior of the church. There is a lot to do over the next 12 months; water to lay on, heating to be installed, a balcony plus toilet, sink and storage facilities to build. The old organ area will become a side chapel/small meeting room and the clergy vestry will be refurbished. Lighting for the lych-gate and path will be installed and inside the church; a projector and screen, a loop system, organ and speaker system. Then there will be replastering and decorating to do. When complete the church will be fully accessible to the disabled. This is a huge amount of work. From an insurance point of view we are paid the replacement cost of the church as it was. Clearly we have designed a church much of which is as it was before the fire but with the addition of improved facilities for now and in the future. The financial difference between the cost as was and what is required to pay for a church that is fit for purpose for the future, is about £100,000. So far through the generosity of so many people and organisations we have £70,000. At the moment we are applying for a number of small grants to help close the gap. We are keen not to have to take out loans because, as is the case for many churches, it is difficult to raise funds each year to pay the running costs and the Parish share. It costs us about £20,000 a year to pay our way at St. Mary's. We are hopeful that now the amount of money that is needed is known, there may still be a number of people who would like to make a donation to help pay the cost of restoring St. Mary's Church. The clergy or churchwardens would be delighted to hear from you if you feel you could help. Throughout the spring and summer work has continued apace. The suspended ceiling has been replaced in the sanctuary and now the scaffolding is removed it can be seen in its former glory of blue and gold. The underfloor heating and radiators, lighting and plastering is well under way and much of the decorating has been done. The stone floor is at present being laid and work continues on the balcony, and a toilet, sink and storage facilities concealed beneath. There is still much to be done but already, even though the windows are still partially boarded to safeguard the glass, the church is full of light and there is the feeling of serenity that existed before the devastation. We are looking forward to the completion of the side chapel/meeting room and the refurbished vestry as well as delivery of a new organ and other furniture and hope that the majority of this will be done by the end of the year. When finished we will have a beautiful church for the community and for future generations. The financial cost between as was and what is required to pay for a church that is fit for purpose for the future, will be £120,000. So far through the generosity of so many people and organisations we have £76,000 which means that fund-raising continues. It is difficult to pay for the Parish Share and running costs of around £20,000 a year, so we are not keen to take out loans that will add loan repayments to this amount. We are hopeful that now we know the amount of money that is needed to complete the work there may still be a number of people who would like to help our fundraising. Please contact the clergy or churchwardens, whose details can be found on this website, if you can help pay for the restoration of St. Mary's Church. Thanks to the generosity of supporters of St Mary's, donations of around £80,000 have been received to date. In addition a generous grant from WREN (Waste Recycling Environmental Ltd) of £15,000 has been awarded to provide a special high quality projector, screen and furniture for community use in St Mary's Church. This will be useful to enable community groups of all ages to give high quality presentations. Refurbishing the interior of the church is making great strides and we hope the church will re-open early next year. The church is looking wonderful and we have a date for re-opening at the beginning of April. We are truly thankful for the skilled work and dedication that has gone into the rebuilding and are waiting with great excitement to the re-opening. We have a magnificent new organ, a beautiful font, lectern, pews and other furniture and so many other features including a lovely stained glass window over the altar, that it is difficult to list them all. We feel sure this small church will attract people now and in the future to want to visit and use the church for worship and also concerts, meetings and presentations. "It is a great joy to be celebrating the re-dedication of St. Mary's Church today, four years after the fire that reduced it to a ruin. We celebrate many things today: the faithful determination of the clergy, parishioners, friends and community who have patiently raised funds and waited for the faculties to allow work on a restored building to proceed; the skill of the architect, Shona McKay, and of the two building firms involved in the structural work; the craftsmanship which has refurnished the church beautifully and appropriately, given it arresting stained glass, striking new furnishings and provided a magnificent new organ. Above all, we celebrate the confident witness to Christian hope, community and presence, which has not wavered, even when it was difficult to see anything salvageable in the aftermath of the fire. Today, all these things are offered to the greater glory of the God who makes all things new".